The film was also shortlisted in the Outstanding British Film, Costume Design, Make-Up & Hair, Cinematography, and Editing categories. The ceremony took place at London’s Royal Albert Hall. Queen's Brian May was in attendance, accompanied by his wife, actress Anita Dobson. Roger Taylor attended with his wife, actress and producer Sarina Potgieter. 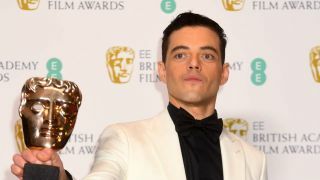 Last month in Los Angeles, Bohemian Rhapsody won two Golden Globes. It's also been nominated for five Oscars. Bohemian Rhapsody will be released on DVD, Blu-ray and on 4K digital on March 4 via 20th Century Fox Home Entertainment.